I bought a World of Nintendo Skyward Sword Link figure last year and I’ve been dying to put his faithful horse Epona with him ever since. 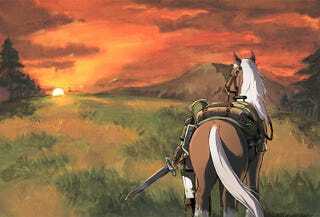 Of course, Epona is not a figure that Nintendo has licensed in any scale, so I have thus far been frustrated in my longing. Anyway, while I was walking through Toys R Us this morning, I happened to pass an aisle chock full of Schleich figures. I’ve seen these before, but a thought struck me and I went back. Lo and behold, I found a perfect draft horse in their collection! Well, perfect except that it was a male horse. Snip snip, bud. Anyway, a quick perusal of Schleich’s Website shows that they have a simply mind boggling number of accessories for their figures, and I found a saddle and bridle that will require minimal sculpting to make into a screen-accurate replica of Epona’s rig. I’m so excited! I haven’t done any sculpting in ages and I’m really excited to tackle the little intricacies, like the Hylian crest embroidered into the leather or Link’s bedroll. I’ll post updates as they happen, along with an album of the two together once the project is complete!